Occasionally I hear someone say “I’m only voting my conscience, I’m never voting for someone who doesn’t line up with my values ever again.” While I applaud people wanting to live out their values with integrity I think there is something misguided about this thinking when it comes to politics. Unfortunately in a society with conflicting values it’s impossible to get everything you want. Some complain that life isn’t full of only two choices so elections shouldn’t be either. But the reality is that it is typically difficult to build a large enough consensus to have more than two electable candidates. Life often gives us more than two choices, but elections only give us one result. At times seeking complete uniformity with your values may actually promote a candidate who is the antithesis to your political goals. This is called “The Spoiler Effect“. This was never more apparent than the 2000 election when Al Gore and George W. Bush came out of Florida with a virtual tie. Bush eventually emerged as the winner by less than 600 votes. Ralph Nader had won 97,000 votes. Nader’s voters clearly wanted something that more resonated with their values out of Al Gore but there is little that would have appealed to them about a Bush Presidency. They sacrificed “good” on the altar of “perfect” and walked away with something terrible. Some people wish to vote their conscience so they can sleep well at night. I would find no more rest in knowing that my actions had an unintended negative consequence. In fact I think voting “your conscience” in some occasions can be a rather selfish thing to do. It allows the voter to proudly claim that they aren’t part of the problem when in fact they chose to throw their vote away than accept an incremental improvement. I created this chart to show that political agreement is not the only thing to consider with a candidate. The other is electability. The light gray line displays a candidates agreement with your political values. 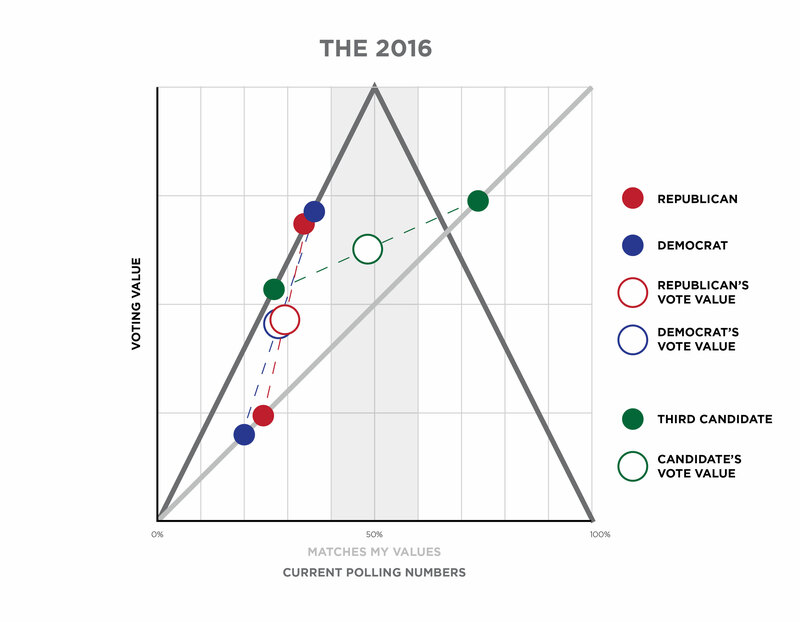 The dark gray line displays where they are in the pre-election polls. When a candidate only has 50% of the electorate the value of your one vote is at it’s peak. When you average the value of a candidate’s political alignment with the weight of your own vote you can find the total value of your vote. In this case for the Nader voter, a vote for Ralph Nader would actually be worth less than a vote for George W. Bush to their overall political objectives (a bizarre as that may sound). When the value of your preferred candidate is less than the value for the candidate you despise, you should pause your quest for the perfect and choose someone that has more mainstream appeal. Ralph Nader had very little chance of winning the election. Nader voters decided to send a message to Al Gore. Unfortunately for them the message that was delivered was “We would love to have George W. Bush in the White House”. This same thing happened in the 1992 election when a large portion of voters decided to vote for the populist Reform candidate Ross Perot. 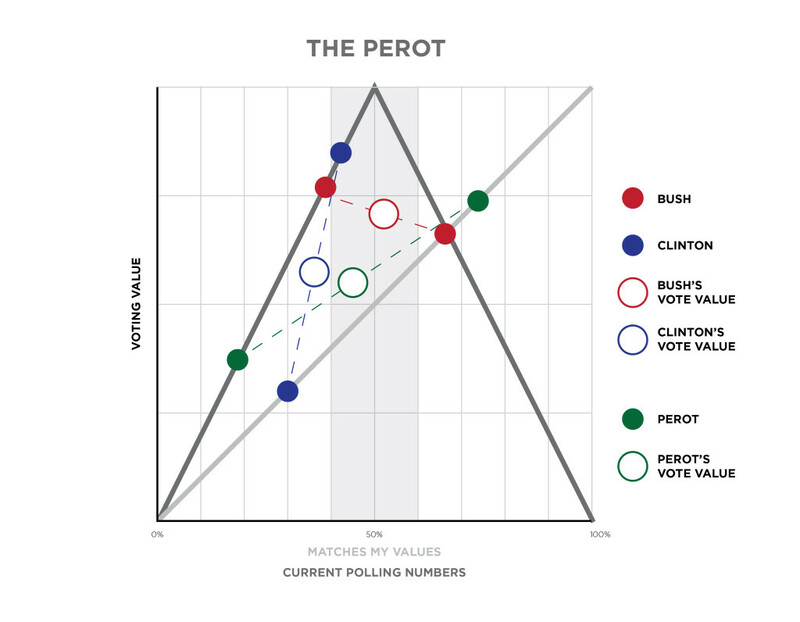 Most Perot voters were much more aligned with Bush than Clinton, but their vote had the practical impact of being a vote for Clinton. I think there are times when it might be appropriate to vote for a third party candidate. I’ll give you an example from an election in recent memory. A special election was called for in 2005 to replace a suddenly vacant Congressional seat in California. The district was strongly aligned with the Republican party. The Republican candidate was polling over 70% for the election. Jim Gilchrist emerged as a third party candidate with the “Minutemen”, a group of volunteer border agents. Gilchrist ran the exact same platform as his Republican opponent with the exception that he believed in stronger border security and unilateral deportation of illegal immigrants. The Republican establishment had little fear that they would lose the election but knew that if Gilchrist gained more than 20% of the vote that immigration reform was going to be an immediate concern for them. In this case, it made sense for voters who wanted stronger border security to vote for Gilchrist, as it would in no way lead to the Democratic opponents election. 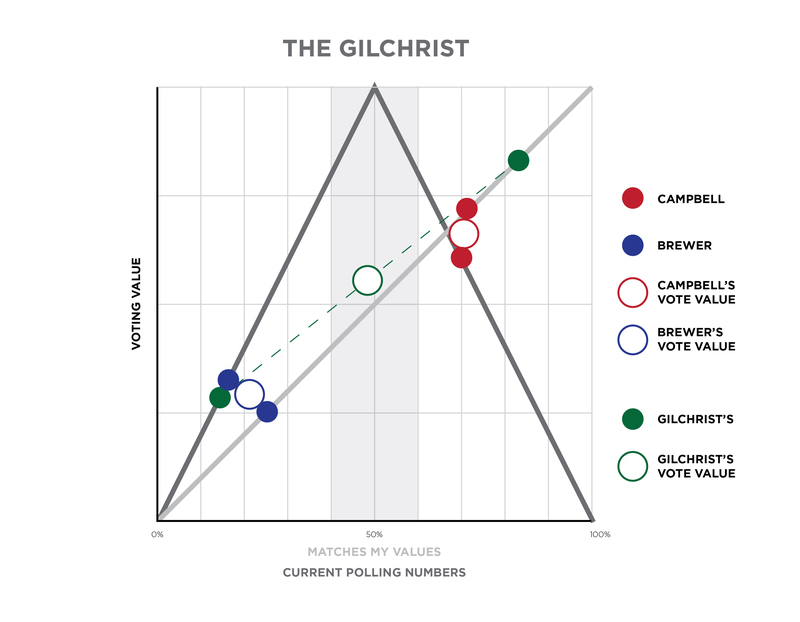 It turned out that Gilchrist earned less than 20% of the vote and the Republican candidate won in a landslide. A strong message would have been sent if Gilchrist had earned more votes. In districts where a “good” candidate has no chance of winning or losing it makes sense to vote for some one much closer to the “perfect” candidate for the sake of sending a message. Another possible situation that might justify a third party vote is something like what Republicans face in 2016 if Donald Trump wins the nomination. Trump and Clinton’s policy positions are either closely aligned or both negative options in the eyes of a Conservative Republican. Both Trump and Clinton have sharply negative polling numbers. 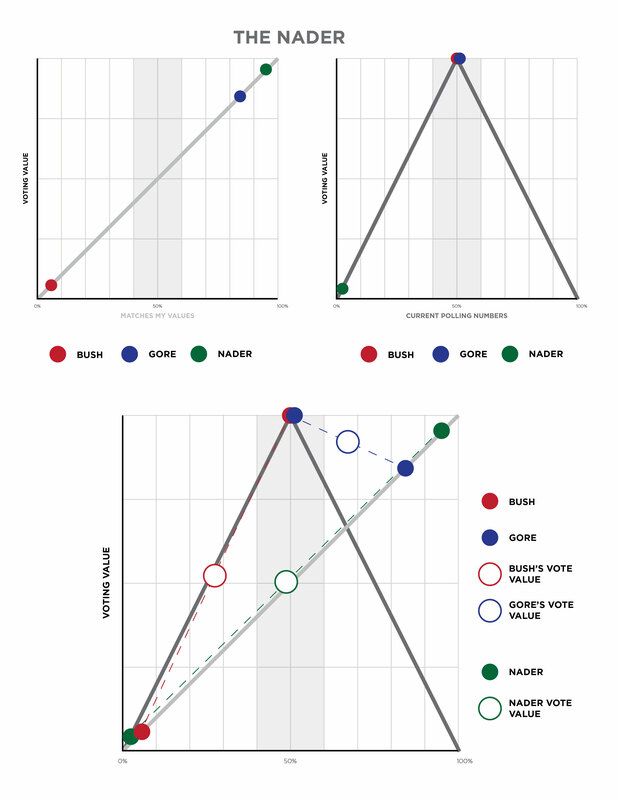 A viable third party candidate might garner enough of the voting value scale to justify a vote if the candidate either is closely aligned with the voter and/or polls quite well. Since both mainstream candidates are equally negative options, a third-party candidate is justified. Voting for a third party candidate may have the appeal of better aligning with your political values, but if the candidate lacks the possibility of being elected, it has the negative affect of electing some one you strongly oppose.